I head to Iquitos for Christmas, a town deep in the Amazon jungle, accessible only by boat or plane. Since time is running out I chose the plane. With hot, dense green jungle, this is a world away from the Andean part of Peru. 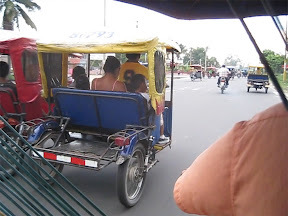 Cars are scarce here so most use tuk-tuks instead, which they call motocars. It almost feels like I’m in Thailand. A short boat ride up the Amazon is the Butterfly Farm, where I meet an amusing monkey. Next, I head out for a 4 day expedition into the jungle proper. This entry was posted in Travel on May 5, 2010 by steveridout.